Versatile, convenient, light-weight, durable plastic Braille labeler; a terrific product and a great buy. Labeler can produce both Braille letters and numbers. Can emboss Braille on 3/8" or 1/2" vinyl labeling tape. 1 roll of half-inch wide, 8-foot long tape is included. Spin dial to select letter, squeeze trigger to make Braille symbols, then cut, peel and stick on. Measures 10" long, 4" wide, and 2" tall. No knowledge of Braille is needed to use this device. Upper rim of dial is embossed in Braille; lower rim is marked with regular print. Dial features complete alphabet, number sign, most commonly used Grade 2 Braille contractions, and many punctuation marks. 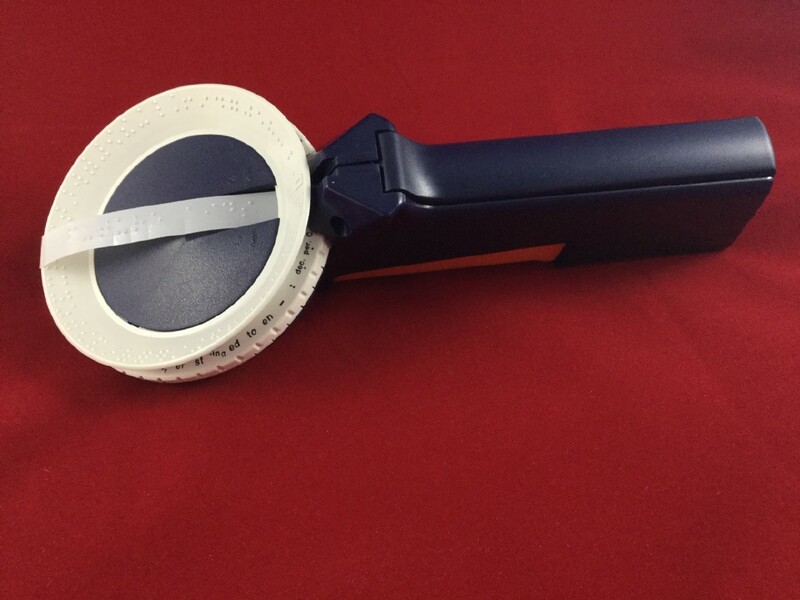 Built-in tape-cutter cuts label off straight and gives easy-peel tab. Label anything; give blind people unparalleled independence and freedom. Measures about 10 in by 4 in by 2-1/2 in. Similar to the Dymo labeler you'd pick up at your local office depot, this machine is a simple, affordable solution for making up embossed labels. When you squeeze the trigger to emboss a letter, however, it is punched into the tape in Braille instead of print. In this way, you don't even need to know Braille to make up perfect, sharp labels your blind friends can read! This is probably the most versatile, convenient product you'll ever find. Never before offered at such an unbeatable price, our light-weight, plastic, durable Braille label maker is both a terrific product and a great buy! This nifty labeler lets you make Braille labels for almost anything. Jars of jam, cans of soup, bottles of medicine, boxes of cereal, buttons on appliances ... the list is endless. Without a Braille label, blind people have to ask sighted friends to read print labels on such items. CD and DVD cases, files, credit cards ... all these have print labels that can't be read by blind folks. But now you can make Braille labels of your own with our Braille label gun, giving blind people unparalleled independence and freedom. What's more, there is no other device available for under a thousand dollars which someone with no knowledge of Braille can use to print Braille. 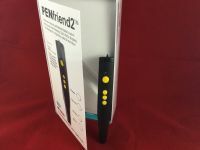 This means that a sighted person who knows nothing of Braille can still use this labeler to write quick Braille notes, sign greeting cards, add Braille to To and From tags, even spruce up class projects on the Braille system or Helen Keller ... The list goes on and on. Our Braille labeler measures less than ten inches long, four inches wide, and stands about two inches tall. To use it, simply hold the unit in one hand, while spinning the dial with the other to select the correct letter. Squeeze the handle, and that letter is instantly embossed in Braille on the tape. And when finished, just cut, peal and stick on your new Braille label. It's that easy. This Braille label maker can emboss Braille on 3/8" or 1/2" vinyl labeling tape (one roll of half-inch tape is included in the package free of charge). The upper rim of the dial is embossed in Braille so blind people can make up their own labels, while the lower rim is marked with regular print so sighted friends can help. The dial features the complete alphabet, the number sign, most commonly used Grade 2 Braille contractions, and many punctuation marks. And last but not least, the built-in tape-cutter not only cuts the label off perfectly straight, but you'll also get an easy-peel tab to boot. Our Braille labeler is portable, convenient, and practical - a must at home, work or school. Making up Braille labels has never been easier! Directions for the Handheld Braille Labeler From Future Aids, The Braille Superstore. Getting Started. Place your new labeler on a table in front of you, with the wheel facing away from you. To load the unit with tape, first lift the compartment door. To do this, hold the front of the handle with your right hand, near the bottom. Then slide your left thumb into the depression near the top of the edge facing you, and push upwards. This will open a plastic door about five inches long. Next, drop a roll of labeling tape into the compartment. Make sure the leading end of the tape is on top and facing away from you, towards the wheel on the labeler. Feed a few inches of the tape through the tape slot, located about an inch past the indented spot in the compartment. Close the compartment door. Regular Operation. To use the labeler, pick it up with your right hand. Allow your fingers to rest on the trigger of the unit. Spin the wheel with your left hand, and line up the Braille character you would like to write on the tape with the indented rectangle found just past the hinge for the tape compartment discussed earlier. Squeeze the handle to emboss that character on the tape. (You won't have to squeeze very hard.) To do a space, simply squeeze the handle lightly - regardless of what letter you're lined up on. And to produce numbers, just select the number sign # (found directly to the left of the Cut rectangle on the wheel, then use the letters A through J to represent the numbers 1 through 0. When the label is finished, spin the dial to the cut mark (a raised rectangle on the wheel - found just to the left of the letter A) and squeeze the trigger. Pull off the tape, then lightly press the handle three or four times to advance the tape, ready for your next label. Finally, peel off the backing, using the easy-pull tab made by the labeler, and stick it on the item you'd like to label. That's it - happy labeling!